I'm trying to understand this genetic map World map of Y-DNA Haplogroups and reading this article Settlement of the Americas. The article says North America and South America were settled by people from North Asia by way of the Beringia land bridge and/or from Northeast Asia via travel water. So did these people from North / northeast Asia who migrated to Latin America, have any ancestors in common with the Chinese, or has there been migration from North Asia to China which would mean the modern Chinese have some ancestors in common with current Latin Americans? The basic answer is no. There is no better connection between the people of the Americas and the Chinese people than there is for any other groups of humans on the planet. Probably the best way to view the peopling of the Americas is that there was constant interaction throughout human history through Beringia. Land bridge not required. Human beings know how to make boats, and it now seems even likely coast-hopped around the glaciers back when they were a thing. So the source peoples for the Americas were basically all the groups of people who were living in far northeast Siberia through human history. The Chinese people linguistically belong to the Sino-Tibetan language family. Their ancestors were probably all living on the tibetan pleatau more than 6000 years ago. When domesticated rice and millet made their ways up the Yangtze and Yellow rivers respectively, the Sino-Tibetians who took to it fully were thereafter able to use their sheer numbers to push any non-farmers out of the various river valleys of China. 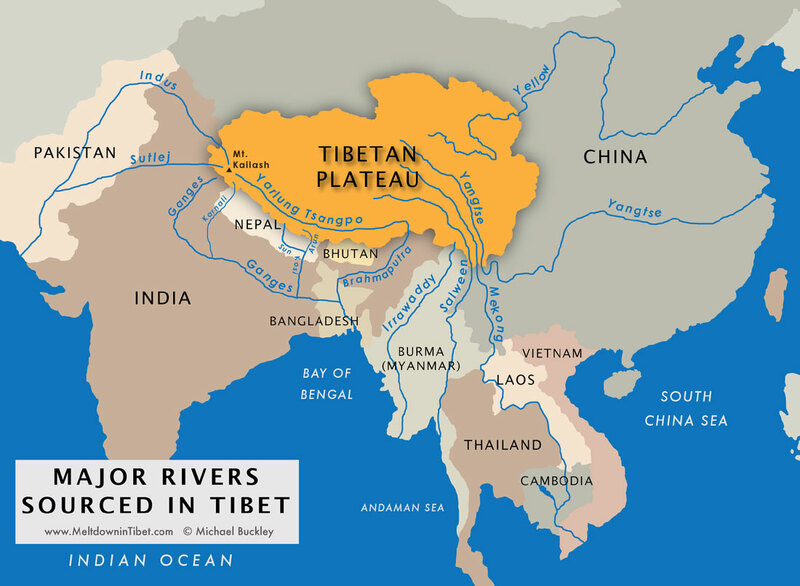 Other groups of Sino-Tibetians pushed south into good river valleys that were usable for their rice. However, neither crop grows well in Sibera, so they have not until recent times ever colonized areas much further north than Manchuira. The land past there was just of no use to their rice/millet culture. One thing you may notice about the Tibetan Plateau is that it is way, way, far away from Beringia. So even any connection further back that linguistics can look is going to be fairly remote. It seems every human on the planet has a least one common male and female ancestor roughly 200,000 years ago (give or take rather a lot), and Homo Sapiens Sapiens first left Africa about 50,000 years ago. So if 50,000 years ago counts as recent for you, good news! Nearly everyone outside of sub-Saharan Africa is recently related to Chinese! People first moved into the Americas about 10 - 20,000 years ago. Again, Genetics is really rough right now, and implies nothing really about cultural movement, but even with that caveat, very few of the prevalent halplotypes in Native Americans can be found among the Chinese. What strong connections exist appear to mostly be with various north Asian peoples such as the Mongols, Yensieans, and assorted other Siberian peoples (as one would of course expect). I personally wouldn't consider any connection far prior to the retreats of the ice sheets associated with the current interglacial (about 10,000 years ago) to be "recent". It really was a completely different world for our species before then. It seems unlikely there was any significant convergence of Chinese and Native American ancestry since that time. * - For example, the sickle-cell trait is somewhat protective against malaria. Its spread out of sub-Saharan Africa to some areas in the Middle-East and Europe implies a lot more about the prevalence of Malaria there than it does about the prevalence of Africans. Not the answer you're looking for? Browse other questions tagged native-americans ancient-china prehistory or ask your own question. How densely populated were the Americas prior to European colonization?